Sadly, this slot has nothing to do with the classic '90s arcade game which saw you team up with a partner to bash seven shades of pixels out of a train full of bad guys. Instead Bally's Double Dragon has an oriental dragon influence to it. 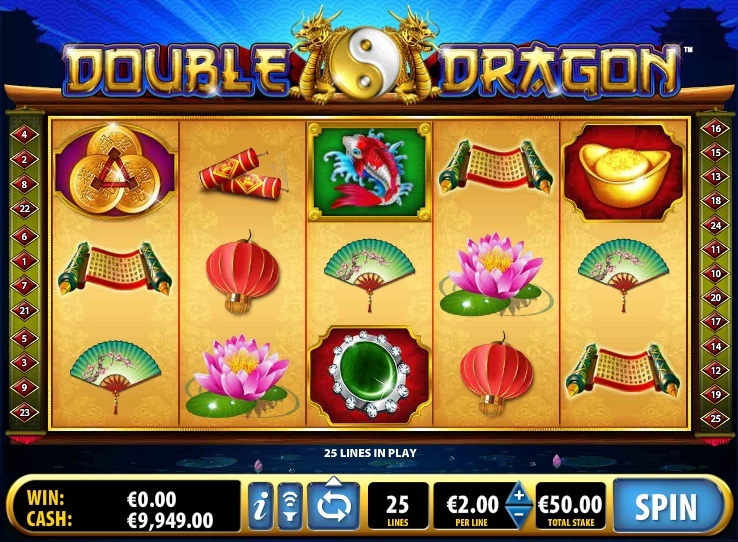 In fact, like this developer's Hawaiian-themed Aloha Island and their similar Oriental-styled Jewel of the Dragon slot, Double Dragon is an online Bally slot you actually want to play. Paylines - 25 of them - are fixed, and there's a solid range of betting available. Coins range from $0.01 to $20, meaning that a $500 top bet is there if you're looking for it. What's good with this game is that winners pay right-to-left as well as left-to-right. Attractive Oriental symbols fill out the reels and include Chinese symbols, fans, lanterns, lotus blossom, ancient scrolls, fire crackers, and gold coins. 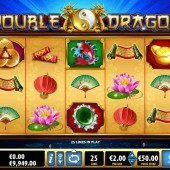 The Koi Carp - that mainstay of all self-respecting Asian-themed slots - is the top payer. It's Wilds Galore in the Dragon Wild Bonus! The gold Yin/Yang symbol is the game's Wild icon and substitutes for all regular symbols in the game other than the Scatters. Hitting one or more Wilds anywhere triggers the Dragon Wild Feature. Any Wild visible will expand to fill the reel. Not only that, though: all reels containing Wilds will lock for a single respin. The feature can be re-triggered. There are no actual bonus features in the game, but then Double Dragon is all about those expanding Wilds. Load up the account with funds, whack up the coin size and try to hit plenty of Wilds in the base game, as that's the main way you'll hit any big wins. In fact, I managed to hit three Wilds in succession a number of times, earning free re-spins every time and some pretty substantial wins. Your bankroll might not handle the swings, but the variance is tempered somewhat by the win-both-ways system.